Ed Protzel has authored three novels, completed five original screenplays for feature film, and developed scripts/projects for 20th Century Fox. His published novels include the first two books in his Civil War-era DarkHorse Trilogy: The Lies That Bind, set in antebellum Mississippi, and Honor Among Outcasts, set in Civil War Missouri. The final book, Something in Madness, set in Mississippi during Reconstruction, will be released by TouchPoint Press in 2019. His mystery/thriller, The Antiquities Dealer, will be released Nov. 5. Ed holds a master’s degree in English Literature/Creative Writing from the University of Missouri-St. Louis. He lives in St. Louis. The Antiquities Dealer by Ed Protzel is a mixture of religious fanaticism and science fiction. Twenty years ago, Miriam Solomon was David Greenberg’s only love. She repaid him by running away to Israel, taking Solly, his best friend, with her. Solly was one of the world's best scientists and now Miriam is phoning to tell David that Solly killed himself. Miriam needs David’s help. Solly was working on a research project that needs to be finished; a secret project to get hold of the last of the crucifixion nails. David can’t be sure that Miriam is telling him the whole truth. What is so significant about that nail? Every person has an agenda in this book and not everyone can survive the consequences. 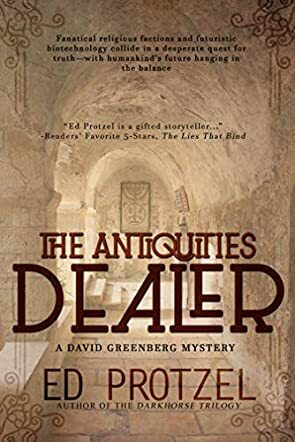 The Antiquities Dealer by Ed Protzel is an interestingly deep story of religion, evolution, and sci-fi. There is no gentle lead-in, we dive straight into the story at the start and we’re off and running on a journey to find what seems to be impossible. There is plenty of depth to the characters, plenty of action in the story, and a very surprising end. Shades of Dan Brown’s books spring to mind with the code breaking and, at the end of the book, we have a neat explanation of the way the code is broken. I enjoyed this story; it was very detailed, with excellent characters that will resonate with most of us. If you enjoy Dan Brown's books, then I guarantee you will enjoy this.